TOM N TOMS COFFEE is a professional coffee franchise brand and an international coffee shop leader which strives to satisfy customer with rich taste and aroma of high quality coffee extracted through its own roasting technology,offering pretzels baked right in the shop, good people and a comfortable atmosphere. 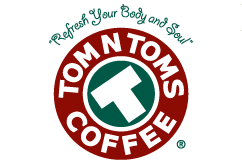 TOM N TOMS is a global coffee business with increasing representation in the world such as the United States, Australia, China, Singapore, Thailand and Mongolia. Furthermore, TOM N TOMS Coffee was the first 24-hours cafe in Korea. Other differentiated strategy in Korea included Valet Parking and offering business meeting room to our customers.